Over the past two years at Johnston Heights we have seen a lot of conversations take place between staff, students and parents about the kind of learning community that we are and the kind of learning community that we want to become. At the beginning of this year those discussions crystallized into the principles of The Learning Project – student growth supported by adult learning, sharing our learning, and integrating curriculum. These principles did not emerge out of thin air, or or own heads, but out of the combination of the changes taking place in our wider culture and our school community. A case in point comes from a recent email, in which Ms Kim shares the efforts of a group of students who created their own learning project. The students probably didn’t think of it that way, they were just thinking about a fun way to give back to their school community. Several kids from the Arts Club had approached me late last year (May) looking for a project to tackle. In response I had joked that there was an old cabinet in my room (a permenant fixture) that was really an eye sore, as the doors were an awful hospital gown blue. I am reminded once again, what caring and amazing students we have here at JH. A shout out to the following students: Jan Paolo Canita, Jenny Nguyen, Jem Gaza, Jona De Guzman, Nelson Yim, Katie Duong, Peggy Liu, Chelsea Pacunana, and Riza Macaranas. They tell me that they will continue to roam the school, looking for the next thing to beautify with their awesome skills! And special thanks to Elizabeth Libera and Gary Smith for supporting their creative endeavors with your time, supplies, and guidance. 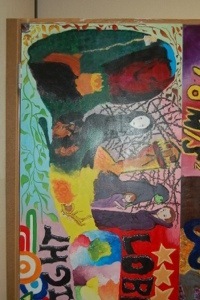 Now Ms. Kim is not just telling the story of a group of students demonstrating their artistic skills on a mural. They have combined several things – their love of artistic creation, their learning in psychology, and and a desire to share both of these things with their community. A few things here stand out for me. One, the students did this on their own time. They were so passionate about this project that they gave up their personal lunch and evening time to get it done. Two, their work is not just decorative, it’s academic. When you look at the photos you can clearly see the involvement of research on brain hemispheres. Will these students remember this learning after they graduate? Absolutely! Three, it’s collaborative. Ms. Kim describes a diverse group of students and teachers involved in the work (including herself), all contributing in different ways. Four, it’s shared as a real product for a real audience. The painting will be in place for years to come, seen by many students and teachers, and not just made for one person to view and then return. What does all this mean for a high school, for Johnston Heights secondary? These are the students that are attending our school. These are the ways they are choosing to learn and express their learning when they can make that choice on their own. We as teachers can benefit from the way our students already learn, from the way we ourselves learn. We can seek out ways to engage student interests, create real products that can really be shared with real people and collaborate with our colleagues to integrate our diverse curricula in ways that make sense. I am very proud of this group of after school art club students who worked so hard and enjoyed every moment of their school “beautification” project. This was completely selfless and created with joy and a giving spirit with no expectation of anything, not even a service award…just a spirit of being together, being creative and then sharing their work with friends and staff. Thumbs up to this crew of creative awesome young people! Thanks for sharing this with the online community, Rob. This seemingly just-for-fun kind of project appears to have really evolved to meet some of the objectives of the school for the new year, which includes that learning be shared, collaborative, and transparent. Very cool! These same students are onto other creative projects for JH staff classrooms. They also mentioned Ms.Kim’s gracious thanks and are feeling so positive and proud of what was accomplished. 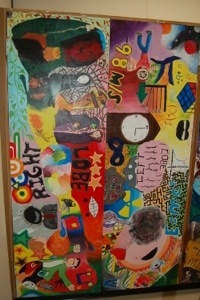 A quote that I overheard from one after school artist was, “we’re leaving a piece of ourselves here…” How cool is that?